How do I get my squirmy-wormy baby to love books? I’ve been fortunate that my kids have loved books from the very beginning. I’ll admit that part of my design was purely selfish: I’d rather read to my children than do almost anything else with them (read: sitting for hours on the floor making train sounds). So they quickly learned that Quality Time With Mom meant listening to stories. During the years that I worked in retail, I was always surprised when a customer, shopping for a baby gift, would say, “I’m not going to buy a book for someone who can’t even talk! How would they understand it?” Who said anything about understanding?! In the beginning, books are simply stimuli: things to touch, to feel, to explore, to eat. They present an opportunity for little ones to listen uninterrupted to a parent’s voice, a sound babies are born loving. And they make for the best snuggle time EVER. But don’t be fooled: the past decade of child development research tells us that, even while they’re hanging out of drooling mouths, books are wielding their magic on babies’ brains, laying the groundwork for early language development and, yes, even lifelong intelligence. So how do you get your squirmy-wormy baby to love books? 1. Start with board books: they fit in Baby’s hands and hold up to copious drooling. 2. Surround Baby’s environment with books from Day One, so they don’t know any different. 3. Store books at Baby’s eye level (baskets work great) so they can dump them out, spread them around, and (my personal favorite) “read them” upside down. 4. Not all books are created equal! When they’re newborns, they might sit through anything, but by the time they’re five or six months old, they’re only going to sit still for Certain Books. 5. What Works for the Under One Set: Anything that invites physical interaction, like a finger puppet that pops through each page, flaps that open and shut, anything with a mirror, or touch-and-feel pages. Bright, simple illustrations (or photographs) with clear, high contrast. Sing-songy rhymes that make your voice interesting; same goes with text that encourages you to be loud then quiet, or make animal sounds, or just-plain-silly noises. Books that you can sing. Also books with photographs of babies (before she ever said “mommy,” my daughter said “baby”). 6. What’s Out for Under One: Illustrations heavy in pastels or cartoonish drawings. Books where the pictures look the same on every page. Books with more than a single sentence or phrase on each page. Books that don’t excite YOU (because, yes, your enthusiasm is a big part in all this). 7. Don’t shelve a book for too long. Babies under two are incredibly fickle: what they push away one week becomes their Obsession the next. Keep trying! 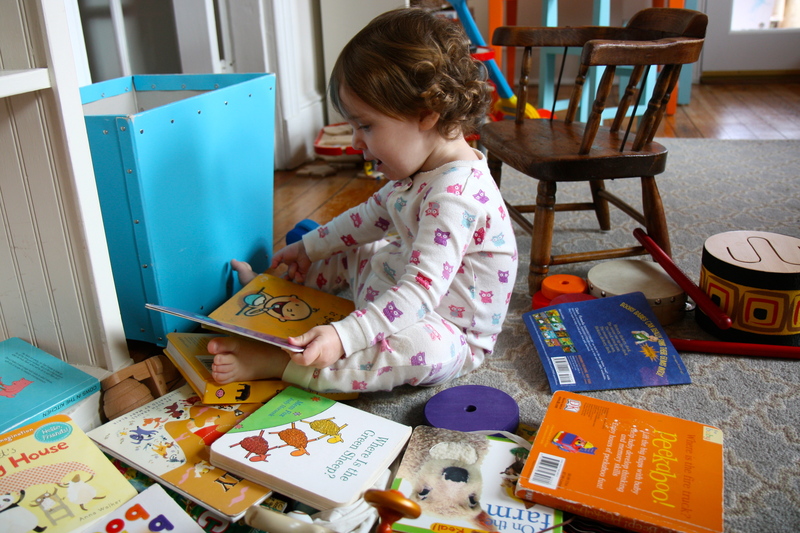 § One Response to How do I get my squirmy-wormy baby to love books? we have SO many of these books in our house! I am a high school English teacher, and when I got pregnant with my first (over three years ago), our house started to look like the kids section of Barnes and Noble. And I would read EVERY book out loud to my pregnant belly. Usually we have just as many books all over the floor as we have trucks and leggos these days. You are currently reading How do I get my squirmy-wormy baby to love books? at What to Read to Your Kids.